^ Carlson, Neil R.; Heth, C. Donald. Psychology the science of behaviour 4th. Pearson Education Inc. 2007. ISBN 0-205-64524-0. ^ 3.0 3.1 Gazzaniga, Michael S.; Ivry, Richard B.; George R. Mangun. Cognitive neuroscience: the biology of the mind. New York: W. W. Norton. 2002: 389. ISBN 0-393-97777-3. ^ Sidiropoulos K, de Bleser R, Ackermann H, Preilowski B. Pre-lexical disorders in repetition conduction aphasia. Neuropsychologia. Dec 2008, 46 (14): 3225–38. PMID 18761023. doi:10.1016/j.neuropsychologia.2008.07.026. ^  ^ Manasco, M. H. (2014). Introduction to Neurogenic Communication Disorders. Burlington: Jones & Bartlett Learning. ^ 6.0 6.1 Damasio H, Damasio AR. 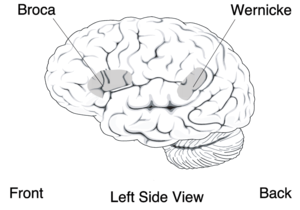 The anatomical basis of conduction aphasia. Brain. June 1980, 103 (2): 337–50. PMID 7397481. doi:10.1093/brain/103.2.337. ^ 7.0 7.1 7.2 Kohn, Susan E. Conduction aphasia. Hillsdale, N.J: L. Erlbaum. 1992: 40–42. ISBN 0-8058-0681-4. ^  ^ Manasco, M. (2014). Chapter 4: The Aphasias. In Introduction to neurogenic communication disorders . Burlington, MA: Jones & Barlett Learning. ^ 9.0 9.1 9.2 9.3 Bartha L, Benke T. Acute conduction aphasia: an analysis of 20 cases. Brain Lang. April 2003, 85 (1): 93–108. PMID 12681350. doi:10.1016/S0093-934X(02)00502-3. ^ Benson DF, Sheremata WA, Bouchard R, Segarra JM, Price D, Geschwind N. Conduction aphasia. A clinicopathological study. Arch. Neurol. May 1973, 28 (5): 339–46. PMID 4696016. doi:10.1001/archneur.1973.00490230075011. ^ 11.0 11.1 Manasco, M. Hunter. Introduction to Neurogenic Communication Disorders. Jones & Bartlett Learning. 2014. ^ Kohn, Susan E. Conduction aphasia. Hillsdale, N.J: L. Erlbaum. 1992: 1035. ISBN 0-8058-0681-4. ^  Ardila A. (November 2010). " A Review of Conduction aphasia". Current Neurology and Neuroscience Reports. 10 (6): 499-503. ^ Tanabe H, Sawada T, Inoue N, Ogawa M, Kuriyama Y, Shiraishi J. Conduction aphasia and arcuate fasciculus. Acta Neurol. Scand. December 1987, 76 (6): 422–7. PMID 3434200. doi:10.1111/j.1600-0404.1987.tb03597.x. ^ Shuren JE, Schefft BK, Yeh HS, Privitera MD, Cahill WT, Houston W. Repetition and the arcuate fasciculus. J. Neurol. September 1995, 242 (9): 596–8. PMID 8551322. doi:10.1007/BF00868813. ^ 16.0 16.1 16.2 16.3 16.4 16.5 Anderson JM, Gilmore R, Roper S, 等. Conduction aphasia and the arcuate fasciculus: A reexamination of the Wernicke-Geschwind model. Brain Lang. October 1999, 70 (1): 1–12. PMID 10534369. doi:10.1006/brln.1999.2135. ^ 17.0 17.1 Conduction Aphasia. www.asha.org. [2015-11-13]. ^ Bakheit AM, Shaw S, Carrington S, Griffiths S. The rate and extent of improvement with therapy from the different types of aphasia in the first year after stroke. Clin Rehabil. October 2007, 21 (10): 941–9. PMID 17981853. doi:10.1177/0269215507078452. ^ 19.0 19.1 Kohn, Susan E. Conduction aphasia. Hillsdale, N.J: L. Erlbaum. 1992: 25–26. ISBN 0-8058-0681-4. ^ Kohler K, Bartels C, Herrman M, 等. Conduction aphasia--11 classic cases. Aphasiology. October 1998, 12 (10): 865–884. doi:10.1080/02687039808249456. ^ Kohn, Susan E. Conduction aphasia. Hillsdale, N.J: L. Erlbaum. 1992: 28–29. ISBN 0-8058-0681-4. ^ Feinberg TE, Gonzalez Rothi LJ, Heilman KM. 'Inner speech' in conduction aphasia. Arch. Neurol. June 1986, 43 (6): 591–3. PMID 3718287. doi:10.1001/archneur.1986.00520060053017. Hickok G, Buchsbaum B, Humphries C, Muftuler T. Auditory-motor interaction revealed by fMRI: speech, music, and working memory in area Spt. J Cogn Neurosci. July 2003, 15 (5): 673–82. PMID 12965041. doi:10.1162/089892903322307393. Hickok G, Poeppel D. Dorsal and ventral streams: a framework for understanding aspects of the functional anatomy of language. Cognition. 2004, 92 (1-2): 67–99. PMID 15037127. doi:10.1016/j.cognition.2003.10.011. Baldo JV, Klostermann EC, Dronkers NF. It's either a cook or a baker: patients with conduction aphasia get the gist but lose the trace. Brain Lang. May 2008, 105 (2): 134–40. PMID 18243294. doi:10.1016/j.bandl.2007.12.007. Carlson, Neil R.; Heth, C. Donald. Psychology the science of behaviour 4th. Pearson Education Inc. 2007. ISBN 0-205-64524-0. Sidiropoulos Kyriakos; Ackermann Hermann; Wannke Michael; Ingo Hertrich. Temporal processing capabilities in repetition conduction aphasia. J Brain and Cognition. August 2010, 73 (3): 194–202. PMID 20621742. doi:10.1016/j.bandc.2010.05.003.